When people talk of organizing, we often think of getting rid of “things.” We found a humorous, and irreverent, resource for tackling the clutter in the rest of our life. 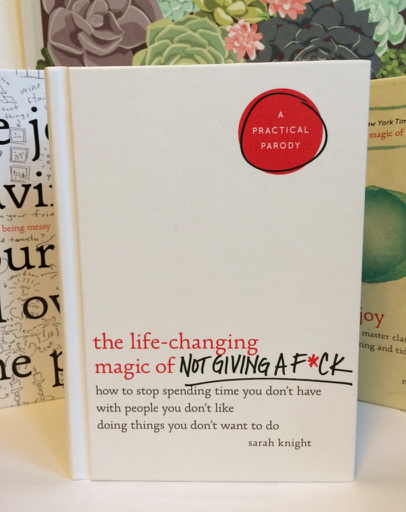 The Life-Changing Magic of Not Giving a F*ck: How to Stop Spending Time You Don’t Have with People You Don’t Like Doing Things You Don’t Want to Do is written by Sarah Knight who gives straight talk on a touchy subject. It’s a spin on the decluttering principles made famous by Marie Kondo – conscious decision making. Crafting a life by design instead of by default. It’s not really a parody, rather it’s a parallel to the Konmari method…it’s Konmari turned on your life instead of your stuff. Fair warning: the book is intentionally riddled with the F-word, but we found if you mentally substitute something a little less harsh such as “care” – as is “don’t give a care” it’s a little more tolerable. We have a limited amount of bandwidth and energy; time and money and we get to choose how to spend that. We get to make a budget of “cares”, so to speak. When you’re spending it on people place and things you don’t really care about, you’re draining yourself. You are keeping yourself from doing things you really want to do and which bring you energy and joy. When you realize how much power you have to give yourself permission to set boundaries and say no, it’s completely liberating! And (bonus!) you can do it without being a jerk. Where do you feel obligated? When do you think of doing something with someone and your feeling is dread as opposed to pleasurable anticipation? What tasks feel inefficient and inconvenient? Dress codes – high heels, come on! Need I say more? Clothes – are you dressing for yourself our outside expectations? Giving and receiving Christmas gifts. It’s hard to keep coming up with original ideas. A lot of time and energy is spent getting there. Review your list and see what you can let go of wholesale. Let them go and move forward guilt-free! We can’t automatically jettison everything we don’t love. You could, however, find ways to eliminate or modify the most onerous parts of that task to help. Hate to fix dinner for your family but want everyone to eat healthy? Buy pre-cooked meats or pre-cut veggies from Trader Joe’s is a good shortcut to a well-rounded meal. Have a standard set of 10 meals you rotate through and don’t worry about whether your family is bored with it. Dread getting dressed for work in the mornings? Make a uniform for yourself so you never have to angst about what you’re going to wear. Anticipate holiday gift-giving with panic? Decide on one simple gift and give it to everyone. One of our hesitations to start shedding off obligations is the fear of offending people we care about or risking repercussions from work or others. It’s possible to be true to yourself and honest without being a jerk about it. Politeness, honesty and authenticity are key here. Saying the truth is usually the best tact. Releasing yourself from obligations that don’t enhance your life is incredibly liberating. Start by noticing where you already make choices about activities that feel valuable to you and build on that. Give yourself permission to say NO – you’ll change your life!